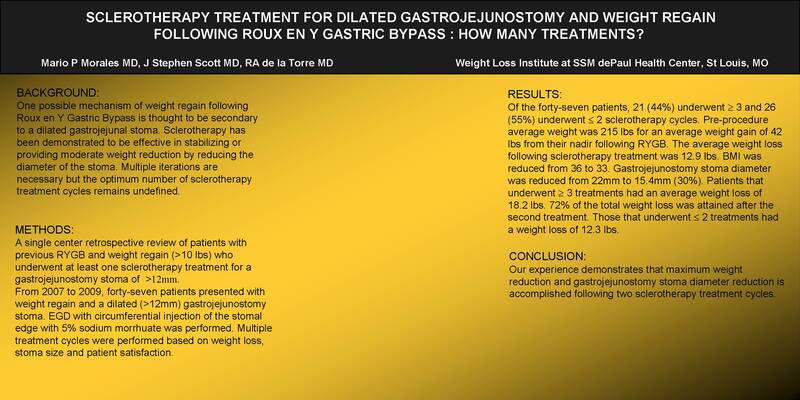 Sclerotherapy Treatment for Weight Gain with Dilated Gastro-jejunostomy Following Roux En Y Gastric Bypass: How Many Treatments? Treatment of weight regain following Roux en Y Gastric Bypass using sclerotherapy has been demonstrated to be effective in stabilizing or providing moderate weight reduction. Optimum number of sclerotherapy treatments remains undefined. A retrospective review of patients with previous RYGB and weight regain (>10 lbs) who underwent at least one sclerotherapy treatment for a gastrojejunostomy stoma of >15mm was performed. From 2007 to 2009, forty-seven patients presented with weight regain and a dilated (>12mm) gastrojejunostomy stoma. EGD with circumferential injection of the stomal edge with 5% sodium morrhuate was performed. Multiple treatment cycles were performed based on weight loss, stoma size and patient satisfaction. Of the forty-seven patients, 21 (44%) underwent ≥3 and 26 (55%) underwent≤ 2 sclerotherapy cycles. Pre-procedure average weight was 215 lbs for an average weight gain of 42 lbs from their nadir following RYGB. The average weight loss following sclerotherapy treatment was 13.6 lbs. BMI was reduced from 36 to 33. Gastrojejunostomy stoma diameter was reduced from 22mm to 15.4mm (30%). Patients that underwent ≥3 treatments had an average weight loss of 18.2 lbs. In this group, 72% of the total weight loss was attained with the first two treatments. Those that underwent ≤2 treatments had a weight loss of 12.3 lbs. Our experience demonstrates that the majority of weight reduction and gastrojejunostomy stoma diameter reduction is accomplished following two sclerotherapy treatment cycles. Further treatments, however, may lead to increased weight loss.